If Disney was really smart, they would hire this guy to make a bunch of traditional-animated films like this! There was a shorter version that Paul Johnson released a few years ago, but this is the full-fledged vision: Star Wars: TIE Fighter. And it is breathtaking. I dare say that I speak for a lot of fans out there when I say that this... THIS... is what we want to see. And see more of. For all the wonder of CGI-animation, the traditional 2D style has more... I dunno... "character"? "Emotion"? How about "heart"? And that's what this video has in spades. This is as much of a Star Wars story as the live-action films, in my opinion. And it's one that I would gladly pay to see more of at the box office. My head exploded watching it. Wish Disney would do a weekly show like this. 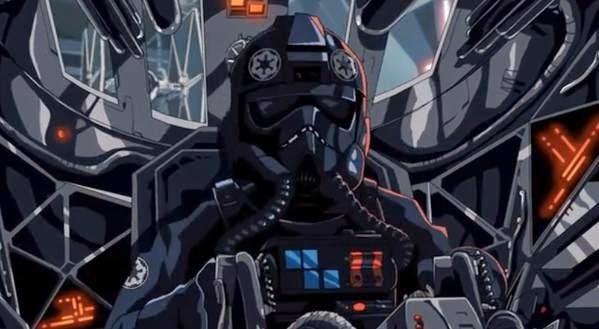 Star Wars + Robotech style = flawless victory. My jaw hit the keyboard. More than that I cared more for the characters in these 7 minutes than I have a whole season of Rebels. Wish there could be more like it. But are there supposed to be female tie pilots? I've never seen that until now. There are indeed lady TIE pilots. And depending on how much of the lore you choose to hold to, there are more women pilots in the Imperial ranks than there are among the Rebels! In the *addictive* X-Wing Miniatures Game, there are definitely more women pilots available for the Empire than there are for the Rebels. Not only that but the women are some of the best pilots you can use. Howlrunner especially: get her leading a TIE swarm and that lady is an absolute horror to fly against. Mackie, from your lips to Disney's ears :-) Robotech is something I never could get into but I definitely admired the animation style. And it's a mature style too, well suited for Star Wars. I'm still haunted by the first time I ever saw a Robotech episode. I was home sick with the flu, bored to death and so I turned on the TV to see what shows I was missing when I was in class. Robotech was on. I thought that giant space robot/fortress was pretty awesome! Then it got hit by missile fire and this stuff started flying out of the hull breach. It took me a few moments to realize "Wait a second... those are PEOPLE being sucked out into space and dying!" Liked the animation, hated the music. Star Wars music has to be timeless, and the hard guitars will seem dated in just a few years. But again, the animation was fantastic. From what I've heard in a few places, Johnson couldn't use any of the familiar John Williams score. And the reason for that is because if he had, YouTube would have probably flagged it as copyright violation and potentially yanked the video entirely. Hence the "heavy metal" score.